…Levierre, with an action-packed cover full of aliens. Levierre was the clear winner in the 99designs poll, in which over thirty people participated, and was my favorite, too. 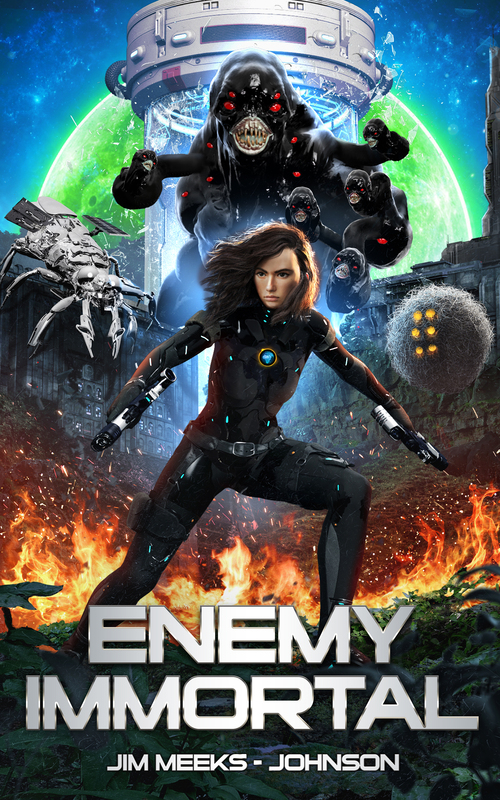 This cover will be used for both the ebook and paperback editions of my soon-to-be-released book Enemy Immortal. First I had to set up a contest. I described what I wanted and offered a prize for the best design. I wanted a cover for both an ebook and a paperback. I had a book blurb and some general ideas that might work, so I put those out. And I had to estimate the number of pages for the paperback since I hadn’t formatted it yet. This turned out to be the only glitch farther along. My page estimate was quite a bit off, and we had to change the spine size after everything else was over. But back to the process. There are three levels of prizes, and three levels of designers, with only top designers allowed to compete for the top prizes. My budget suggested using the lowest level of prize, open to any designer. I figured this would be worth it since my alternatives were to find a designer with whom I had no history or try to do it myself. I took the plunge and attracted about thirty designers, who were split between entry-level and mid-level in their 99designs rating. In the first round of the contest, any of the freelance designers on 99designs could offer a design concept. I gave many of them feedback and soon discovered which designers were easy to work with. I ended up with eight great designs, but I could only take six of them into the second round. I used the poll feature which 99designs provides and reached out to some writer friends for their input. The lowest two designs were eliminated. The second and final round allowed me to work with the six finalists to further refine their designs. Now the hard part–I had to pick just one. First, I did a secret, subjective rating of how easy I found each of the designers to work with. Three of them rated terrific, and three of them only fair. Then I set this aside to use as a tie breaker if need be. The main criterion would be the best design. I ran another poll with the six finalists and reached out to all my facebook friends to participate. A big THANK YOU to all of those who responded. Levierre was the clear winner. The final stage of the contest was to declare the winner and obtain the source files for the cover design. This went smoothly except for the part where I found out my page-count estimate was off. Fortunately, Levierre was one of the “easy to work with” designers and quickly updated the paperback cover to fit the book properly. Now it’s (almost) ready to go. I can’t wait to have a proof copy in my hands early next week. I installed a home security system a couple years ago and added some home automation to it recently. These are a few of the things I learned along the way. If you are in a hurry, jump to Number 6. What is DIY home automation? DIY (do it yourself) in the home security market means you select and install the base system and sensors yourself, following simple directions and/or googling for help. You will likely monitor alarms yourself (though you may be able to buy monitoring services) when you are away and call 911 if there is a problem, so having a smartphone is essential. You will want reliable internet service from your home, too. Home automation means your base system controls appliances in your home. These can be the thermostat, lights, door locks, or virtually any other electrical appliance. Home automation is a relatively new market, and we can expect to see a lot of growth and improvement over the next few years with players like Amazon Echo and Google Home getting into the market. Home automation is an important aspect of the IoT (Internet of Things). I chose Piper, which was highly rated at the time, for my security vendor. There are several new players in the market now, and Piper may no longer be the best choice, depending on your needs. Do your own research before buying the system that is right for you. I like Piper because it’s simple and inexpensive. One box holds the camera, motion detector, z-wave hub, microphone, loud noise detector, speaker, thermometer, and siren. I put the main unit where it had a good view and added a few door/window sensors–a magnet on the door and a little sensor box on the doorframe–both of which can be attached with the included adhesive pads. My smartphone served as the control panel. Piper and most other systems connect to your home internet router to send video to the web, where it can be stored or streamed to your phone or browser. Piper’s video storage is free, but many systems charge a monthly fee for storage, so do your research. Many of the newer systems provide cellular data as a backup in case your internet is down. Getting the hub to connect to a sensor is pretty much like pairing your smart phone to a Bluetooth device. You put both devices in connect mode, and they do the rest. I had some trouble with this as first, but I think it was because I tried press-and-release when I should have used press-and-hold. Home automation is very basic with Piper: a trigger occurs, and something happens. For my test case, I chose to monitor the laundry room for water on the floor and turn off the washing machine if this ever happens (again). I got a z-wave water detector and a smart switch (one that can be turned on and off by z-wave command). They were easy to add to the Piper hub now that I am experienced. Then I hit a snag. The security-oriented Piper folks don’t provide an option to turn anything off. They assume, apparently, that you will want to turn on the lights if an intrusion occurs, and that’s all. IFTTT to the rescue. This free web service at IFTTT.COM will interface with a variety of systems and allow one system to trigger the other. (IFTTT stands for IF This Then That). Piper participates, so I was able to define a rule to sense water and turn the switch off, as desired. IFTTT is a very powerful service. It connects to a variety of home devices, news sources, email clients, google services, etc. You might find you can automate several tedious parts of your digital life. I found the IFTTT location service particularly useful. I set it up to track my cell phone’s distance from home, and every time I leave the house, it arms the security system. Every time I return home, it disarms the system. No more forgetting and/or stopping the car to arm the system. Don’t get me wrong, I love the precision and scalability of the metric system, but what if I don’t want precision? “About a yard long” becomes “about a meter long,” no problem. “A few miles” becomes “several kilometers,” no problem. “About a foot long” becomes . . .
I’ve wrestled with this problem long enough. Don’t be surprised if the aliens in my metric-system-based stories have arms, legs, antennae, and reproductive organs about a meter long!